Generally movies are actor driven for the audience but some movies we find that the director is the “hero”. Debutante director Aditya Vikram Sengupta’s Labour of Love” আশা যাওয়ার মাঝে” is one of that kind of a movie. 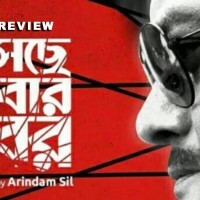 We expected that, as this film already recorded a huge success in various part of the world along with prestigious National Awards won by Aditya , this will also attract only intellectual people of Kolkata. But on Saturday evening it was packed hall and excitement was high about the movie ,from 18 to 80 we found all kind of people eagerly waiting for it. It is indeed a huge labour put in by Aditya and his team and his love towards making good films reflected in every shot of it justify’s the English translation of the title. In cameras Mahendra J Shetty and Aditya has done a great job which actually threaded the film and became the story teller. Feel of the movies was the background score, they used the daily cacophony we come across along with old radio songs like “ Tumi J amar OgoTumi j amar” and also Bismillah Khan’s Shahib’s Shehnai master pieces. 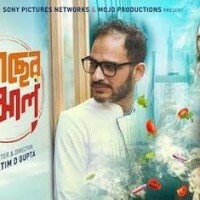 Ritwik Chakraborty and Basabdatta Chatterjee did a nice job as they were natural and in the dream sequence Ritwik showed his class, the power of their expressions did the wonder as there were no dialogues in the movie and as a director Aditya gets the full marks for the actor’s output. As a whole this FOR FILMs production movie is more realistic and close to the people but the make of the movie may not attract many as people majorly fail to understand the expression or the feel and only goes by things which are said verbally. Tollykata thank and Salute Aditya to present a kind of movie which”we don’t watch ,we just feel”. Awesome movie. This kind of movie should be made more.